Sherard Going (or Sherod Going) born 1756 – died Nov 23, 1837 married to Susannah Simmons b. 1770 (marriage June 5, 1791). in 14th Regiment for 3 years. 1781 Apr 19: Sherrod Going enlisted in the Revolution for three years in the 14thVirginia Regiment and enlisted again for 18 months in Albemarle County on 20 March 1781. He was sized on 19 April 1781: age 21, 5’8-1/2″, yellow complexion, born in Louisa County, former service: 14th Va. Regt, 3 yrs [The Chesterfield Supplement or Size Roll of Troops at Chesterfield Court House, LVA accession no. 23816, by http://revwarapps.org/b81.pdf(p.11)]. He was head of an Albemarle County household of 12 “other free” in 1810 [VA:196] and 9 “free colored” in 1820. 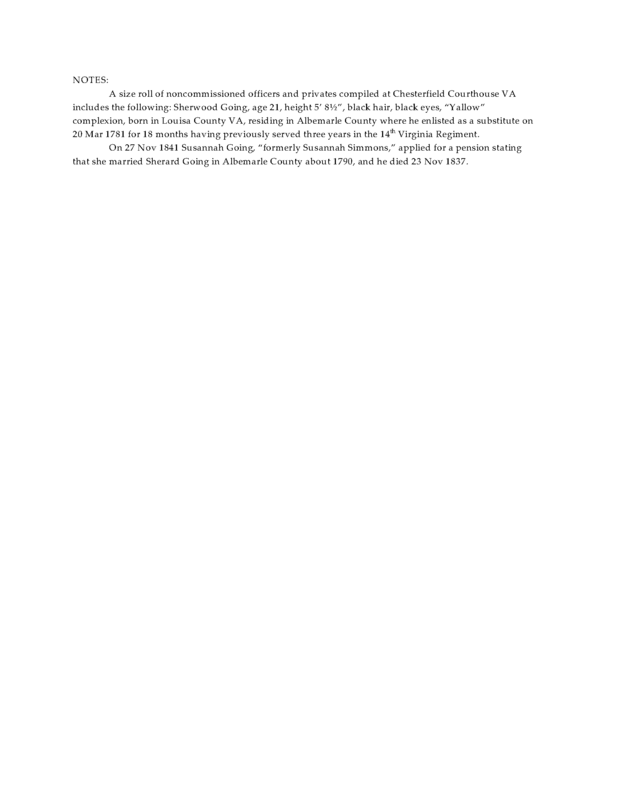 He was a “man of colour” who appeared in Albemarle County court to apply for a pension for 3 years service in the 14th Regiment and another service of 18 months [NARA, W.7545, M804, roll 1087, frame 234;https://www.fold3.com/image/246/22778244]. 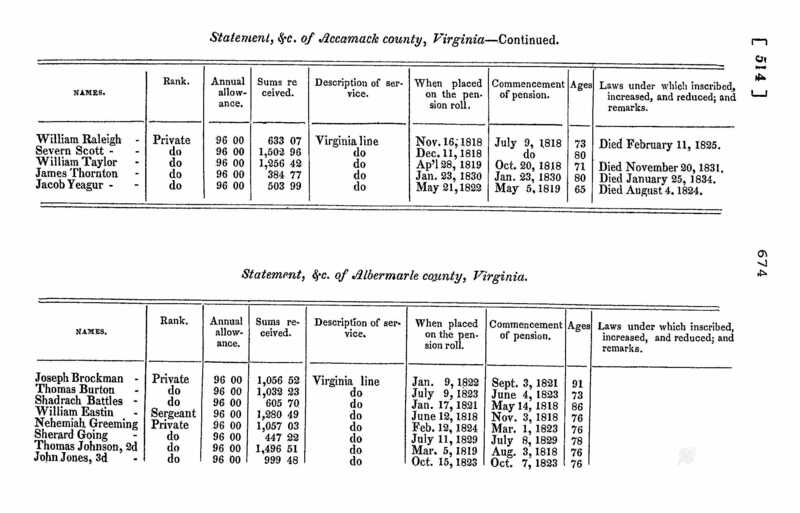 1828 Oct 9 – Sherard Goin resident of Albemarle County, Va, made application for Revolutionary War pension. … at time of application in 1828 he has a wife and two children – two boys aged 10 and 12 years. …In battle of Germantown and Monmouth… and Seige of York…after first enlistment of 3 years, he enlisted again for 18 months. 1841 Nov 27 – Susannah Going (formerly Susannah Simmons) a resident of Albemarle County, Virginia, aged about 70 years, widow of Sherod Going deceased…. Sherod Going died on the 23d of November 1837 … She married Sherod Going in 1790 in Albemarle County, Va by Parson Wood … she has resided in Albemarle County, Va all her life… she has remained a widow ever since the death of her husband …Signed: Susannah Going. …Certification: I … certify that I amm acquainted with Mrs Going the widow of the above named Sherod Going deceased, that she is I verily believe a couloured womon of high respectability and that her declaration is entitled to full audit that from her age etc it would be inconvenient for her to attend court. Signed: Edmund Davis JP. On April 30, 1793, according to “Caswell County, North Carolina Marriages, 1759-1850,” Record 1108, witness Ald Murphy, Court Clerk, Bond No. 15503. James Gillaspy was the bondsman. 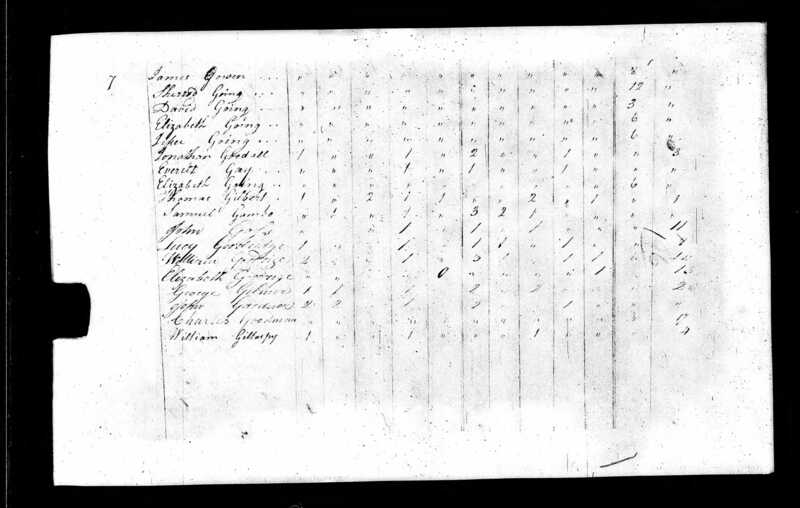 Sherwood Going, [Agnes5, Edward, Jr.4, Edward3, William2, Mihil1] “free colored,” son of Agnes Going, was born about 1756, probably in Louisa County. of Charles Barnett, “mulatto” who was born about 1764 in Albemarle County. Charles Barnett declared that he had “enlisted in the Seventh Virginia Regiment at Charlottesville.” “Sharod Going” corroborated his statement, and in his en- dorsement mentioned, “I was with him at Chesterfield Court House.” “Sherard Gowen” received a grant September 30, 1783 of 196 acres “on the waters of Buck Mountain Creek,” according to “Virginia Land Grants, 1782-1783,” page 575. Sherrod Going was a resident of Albemarle County in 1787 when he appeared on the tax list there taxable on “one tithe, two horses and four cattle.” “Sherod Gowin” received a land warrant in the Military District of Ohio, however it is believed that he sold the warrant rather than move to the new area. son of Drury Going (Note: This is incorrect – This Sherwood Going was son of Alexander Going), was born about 1772 in Brunswick County. Sherwood Going was married to Ruth Bennett April 30, 1793, according to “Caswell County, North Carolina Marriages, 1759-1850,” Record 1108, witness Ald Murphy, Court Clerk, Bond No. 15503. James Gillaspy was the bondsman. Children born to Sherwood Going and Ruth Bennett Sherwood are unknown. Sherwood Going was remarried to Betsy Coventon December 31, 1804, according to “Caswell County, North Carolina Marriages, 1759-1850,” Record 1108, witness Ald Murphey, Court Clerk, Bond No. 55676. James Gillaspy was again his bondsman. Of Sherwood Going and Betsy Coventon Going nothing more is known. final lottery of the state. Orange County May Co 1775. The above acct. of Sales was returned in open Court and ordered to be Recorded. • Deed: Sophia Gowin 200 acres to son Sherwood, 15 Nov 1814, , Pittsylvania, Virginia, USA. 9 Transcription of deed between Sophia Going and her son Sherwood giving him 200 acres of land. 1814, Pittsylvania County, VA. This land makes up half of the acreage owned by Sophia Going. 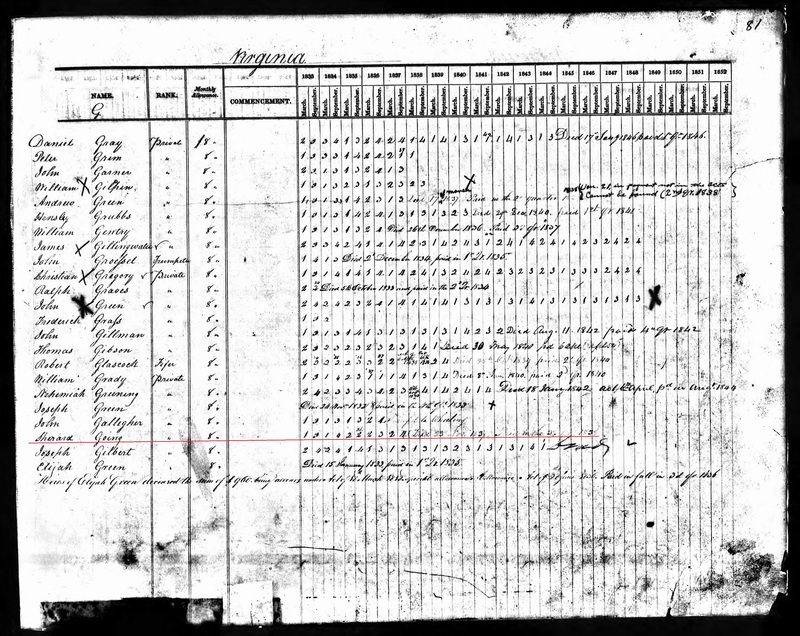 ve Source Citation: 1820 U S Census; Census Place: , Pittsylvania, Virginia; Page: 60; NARA Roll: M33_140; Image: 113. Ancestry.com. 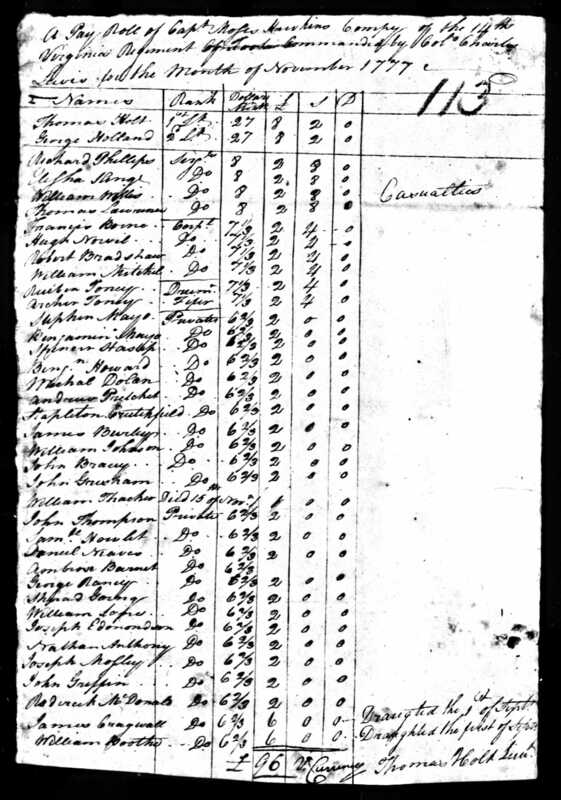 1820 United States Federal Census [database on-line]. Provo, UT, USA: Ancestry.com Operations, Inc., 2010. Images reproduced by FamilySearch. 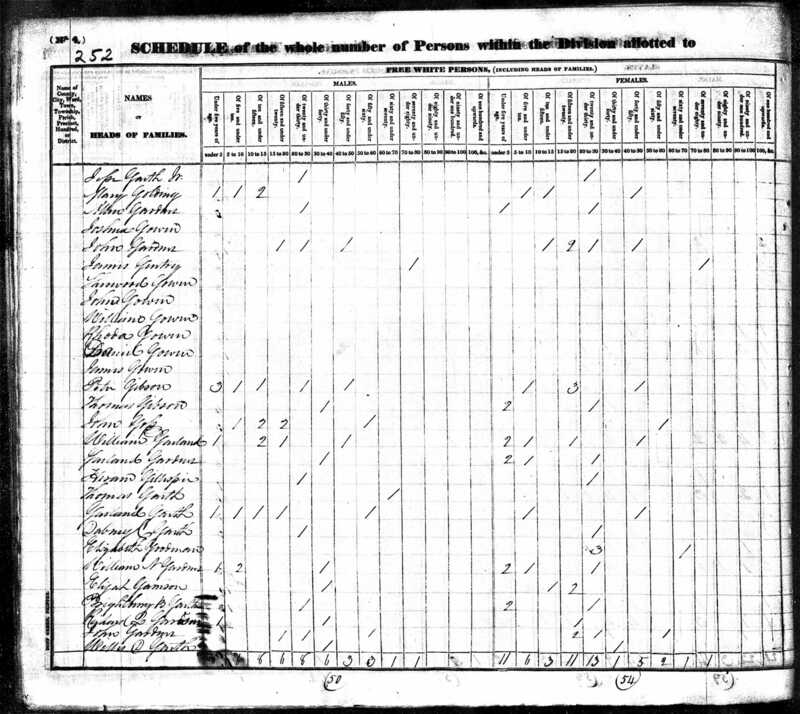 Original data: Fourth Census of the United States, 1820. (NARA microfilm publication M33, 142 rolls). Records of the Bureau of the Census, Record Group 29. National Archives, Washington, D.C.
1 carrutheb, “Rhymes-Bennett Family Tree,” database and images, http://Rhymes-Bennett Family Tree (http://trees.ancestry.com/tree/67610364/person/38196955484 : accessed 23 Jun 2014); Elizabeth Coventon; http://trees.ancestry.com/tree/67610364/person/38193344049. Surety: 2. 2 carrutheb, “Rhymes-Bennett Family Tree,” database and images, http://Rhymes-Bennett Family Tree (http://trees.ancestry.com/tree/67610364/person/38196955484 : accessed 23 Jun 2014); Elizabeth Coventon; http://trees.ancestry.com/tree/67610364/person/38193368332. Surety: 2. 3 carrutheb, “Rhymes-Bennett Family Tree,” database and images, http://Rhymes-Bennett Family Tree (http://trees.ancestry.com/tree/67610364/person/38196955484 : accessed 19 Jun 2014); Sherwood Gowen; http://trees.ancestry.com/tree/67610364/person/38167011974. Surety: 2. 4 carrutheb, “Rhymes-Bennett Family Tree,” database and images, http://Rhymes-Bennett Family Tree (http://trees.ancestry.com/tree/67610364/person/38196955484 : accessed 19 Jun 2014); Sherwood Gowen; http://trees.ancestry.com/tree/67610364/person/38193344049/mediax/4?pgnum=1&pg=0&pgpl=pid%7CpgNum. Surety: 2. 5 carrutheb, “Rhymes-Bennett Family Tree,” database and images, http://Rhymes-Bennett Family Tree (http://trees.ancestry.com/tree/67610364/person/38196955484 : accessed 19 Jun 2014); Sherwood Going; http://trees.ancestry.com/tree/67610364/person/38193344049/comments?pg=32768&pgpl=pid. Surety: 2. 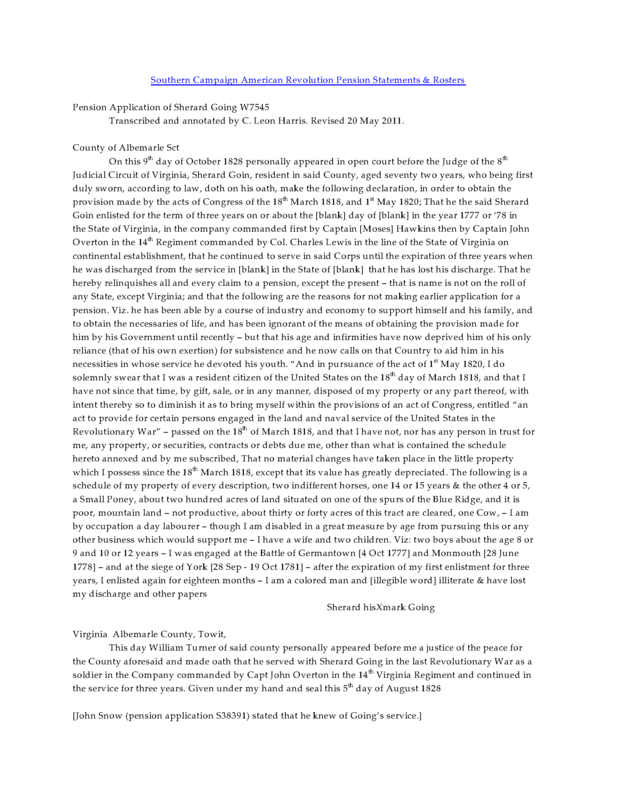 6 Beth Carruth, VA [(E-ADDRESS) FOR PRIVATE USE,], e-mail, July 08, 2014, “Alexander Going Estate Sale”. Surety: 4. 7 carrutheb, “Rhymes-Bennett Family Tree,” database and images, http://Rhymes-Bennett Family Tree (http://trees.ancestry.com/tree/67610364/person/38196955484 : accessed 19 Jun 2014); Sophie; http://trees.ancestry.com/tree/67610364/person/38167011974/mediax/4?pgnum=1&pg=0&pgpl=pid%7CpgNum. Surety: 2. 8 carrutheb, “Rhymes-Bennett Family Tree,” database and images, http://Rhymes-Bennett Family Tree (http://trees.ancestry.com/tree/67610364/person/38196955484 : accessed 19 Jun 2014); Sherwood Gowen; http://trees.ancestry.com/tree/67610364/person/38193344049/mediax/2?pgnum=1&pg=0&pgpl=pid%7CpgNum. Surety: 2. 9 carrutheb, “Rhymes-Bennett Family Tree,” database and images, http://Rhymes-Bennett Family Tree (http://trees.ancestry.com/tree/67610364/person/38196955484 : accessed 19 Jun 2014); Sherwood Gowen; http://trees.ancestry.com/tree/67610364/person/38193344049/mediax/3?pgnum=1&pg=0&pgpl=pid%7CpgNum. Surety: 2.